The Muncie (Indiana) Star recently reported that the Delaware County Redevelopment Commission awarded almost $1 million to a relatively little known German company. Part of the award was $255,000 to install a Vertical Axis Wind Turbine. The VAWT shown in the Star's accompanying photo is the 20 kW version of VAT-Energie's straight-bladed Darrieus wind turbine. According to the article, the wind turbine will be installed on a 120-foot tower prominently adjoining I-69, a major north-south thoroughfare in eastern Indiana. The article goes on to describe how promoters want Muncie to be seen as a leader in renewable energy. Indiana, and certainly central Indiana, has never been known as a hotbed of renewable energy development. As a former resident of Muncie, Indiana, I've taken a keen interest in the project for this reason. Will this project be likely to meet the public's expectations? Let's take a look at the numbers. VAT-Energie's web site displays what looks like a garden-variety non-articulating straight-bladed VAWT, nothing new or earth-shaking there. Lot's of companies have tried this technology before. The web site provides a power curve and some simple stats on the machine. The 20 kW turbine is rated at 14 m/s by VAT and sweeps 36.5 square meters. This puts the turbine squarely in the household-size class of wind turbines like the Bergey Excel, a 7 kW turbine that intercepts about 35 square meter of the wind stream. There is no reference to independently verified testing that this turbine will produce the power curve shown on VAT's web site. As can be quickly seen in comparison to the Bergey Excel, the VAT-20 kW turbine is overrated by almost three times. Unfortunately, this is typical of the new crop of VAWTs. Designer's and promoters greatly overstate what the turbines are truly capable of delivering. The VAT 20 kW, according to its web site, has a rotor loading of nearly 550 W/m². While that's not nearly as bad of some of the big offenders in the "rating game" it's more than twice realistic values for conventional wind turbines of 250 W/m². As I've said elsewhere, Small Turbine VAWTs and Rotor Loading, loadings greater than 300 W/m2 should be viewed with suspicion. But it gets better. It is costing Delaware County $255,000 to install this wind turbine. For that amount of money they could install a wind turbine with a proven track record. 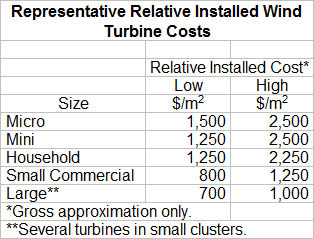 In my recent book, Wind Energy Basics, I report that typical household-size wind turbines will cost $1,250 to $2,250/m². The Muncie VAT-20 kW machine will cost nearly three times that much: ~$7,000/m². Delaware County could have bought a lot more windmill for that investment. Critics of this simple analysis might be quick to argue, "yeah, but the Germans have installed thousands of wind turbines. This is a German company they must know something that we don't." Yes, they do. The Germans know what works and what doesn't. Of the $50 billion German citizens have invested--not their government but Fritz's and Elke's all across the country--an infinitesimal amount has been spent on VAWTs of any kind. Among the 20,000 wind turbines operating in Germany there is no more than a handful of VAWTs. If Delaware County and Muncie political leaders wanted to make a "bold statement" about their commitment to renewable energy and to the future of east-central Indiana, they could have done it by installing a readily available commercial-scale wind turbine. Not only would a megawatt-scale wind turbine produce commercial quantities of electricity, it would be visible for miles around. The last thing that the depression-racked region needs is another example of a failed enterprise.